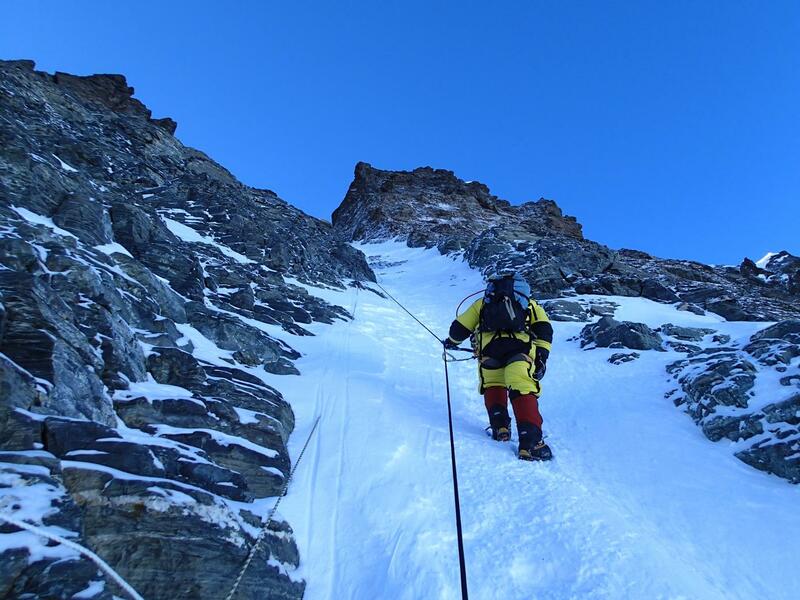 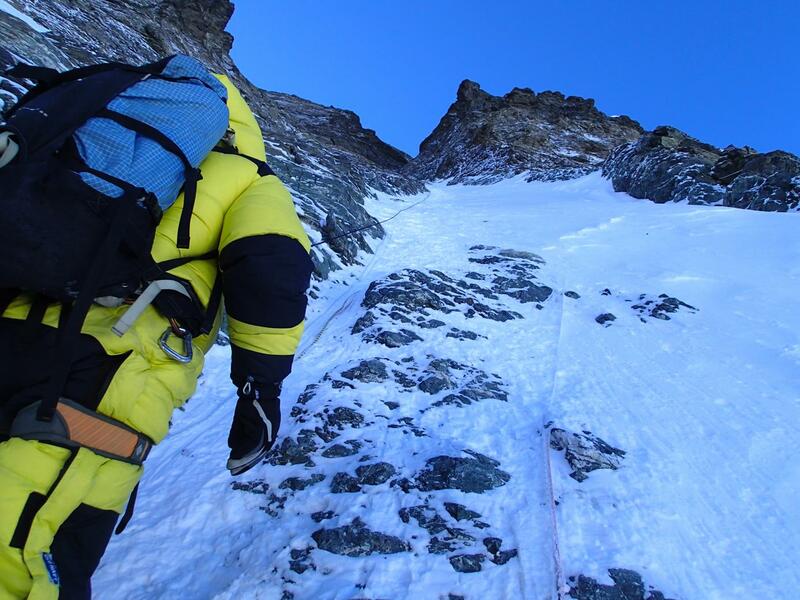 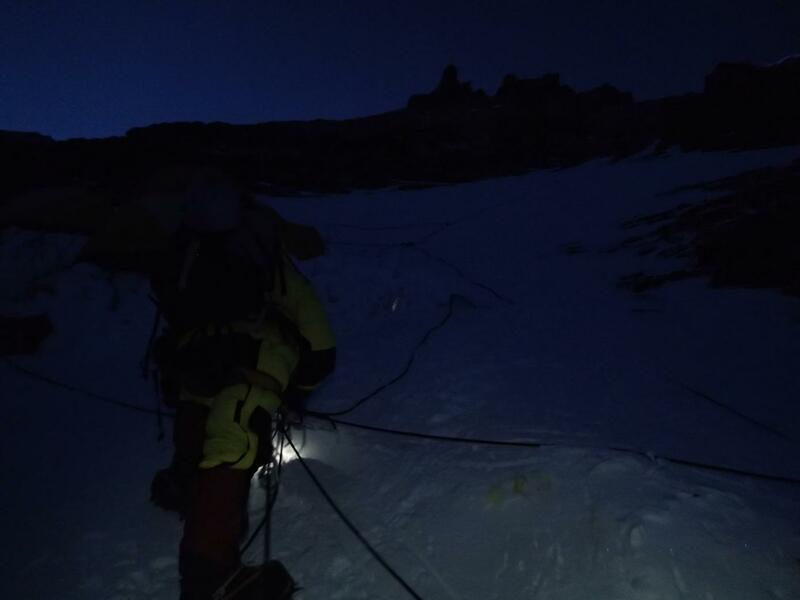 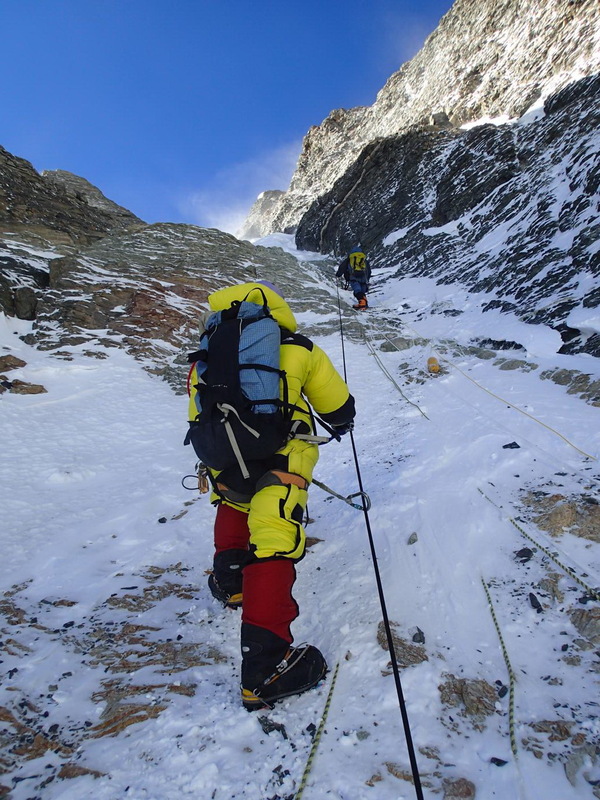 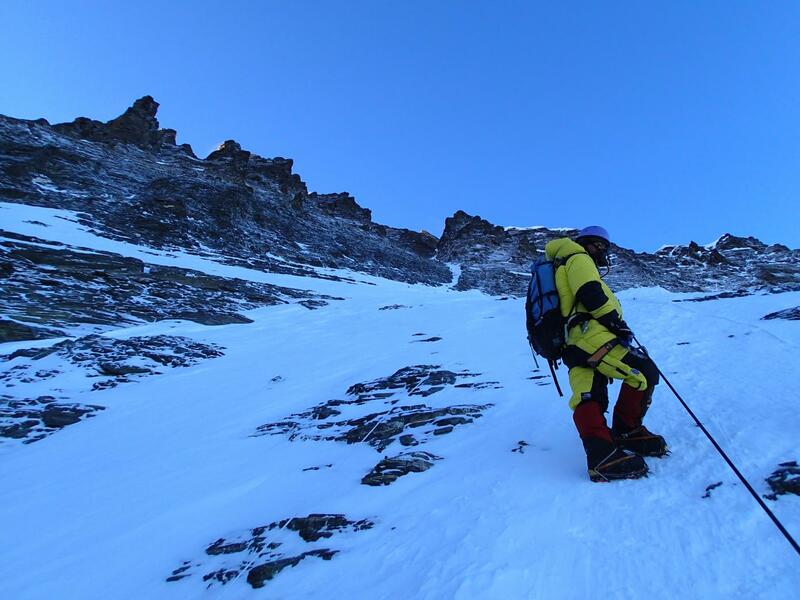 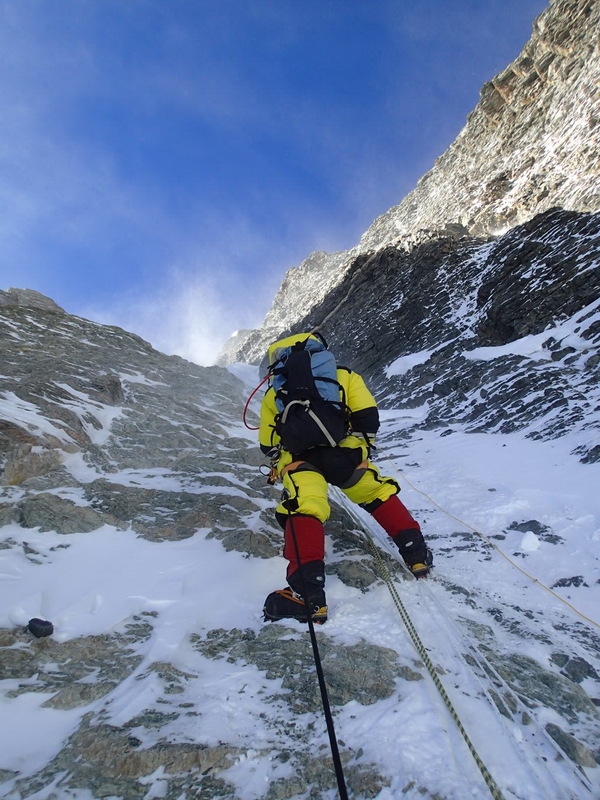 After climbing Everest on May 21, the World’s highest peak @ 8,848m and returning to C4/South Col @ 10am, we rested until 3am the following night, and then set off to climb Lhotse, Everest’s neighbor and the World’s 4th highest mountain @ 8,516m. 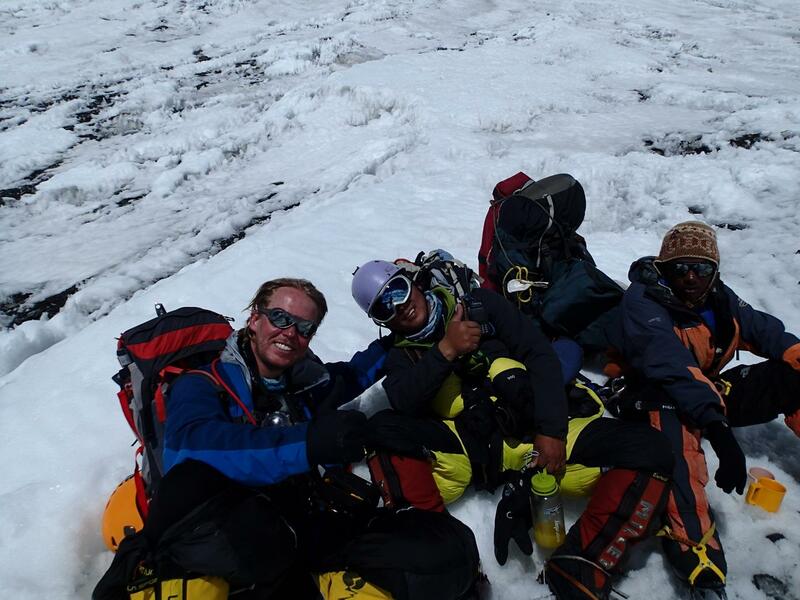 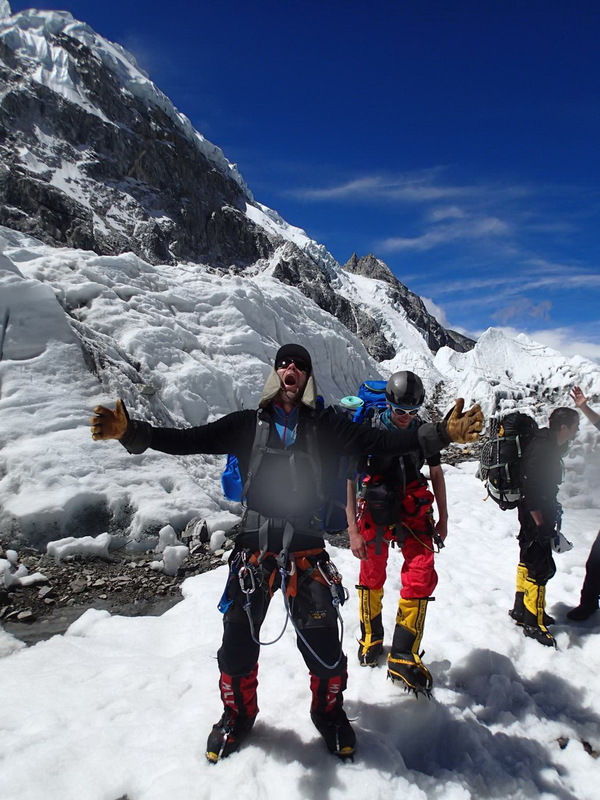 The team was Yours Truly, Ang Gelu, Deano – the lead guide for our Everest expedition, as well as another Sherpa, Rinjin. 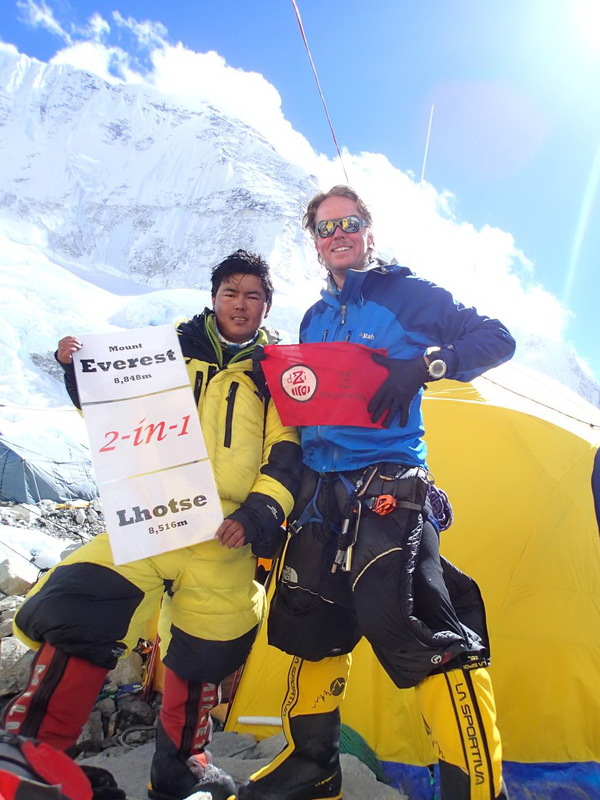 Deano had just climbed Everest for the 9th time (and is the joint current recordholder of Everest summits by a Kiwi), Ang Gelu 4x Everest summiter, whereas I had just climbed Everest for the first time. 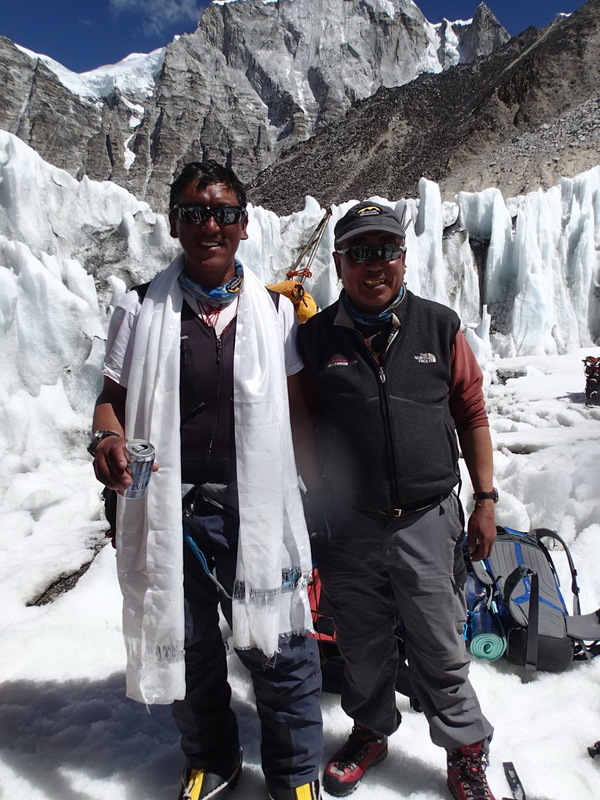 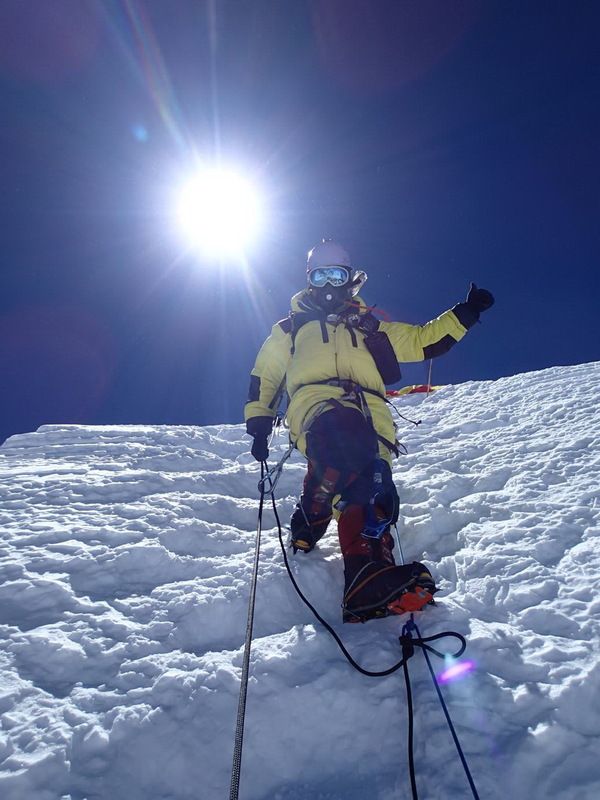 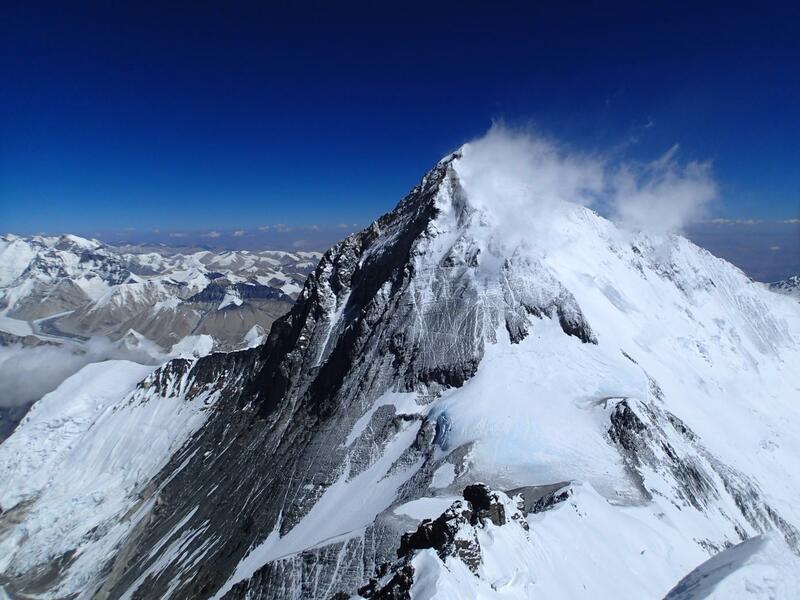 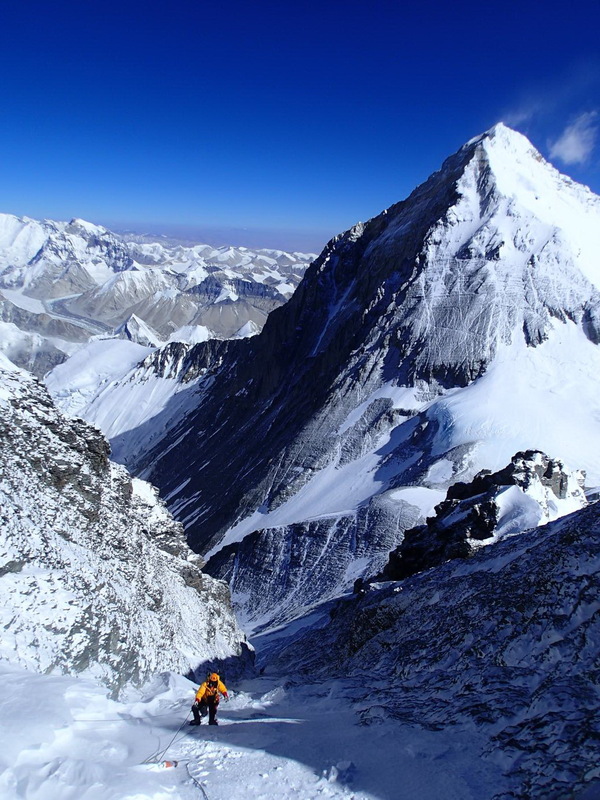 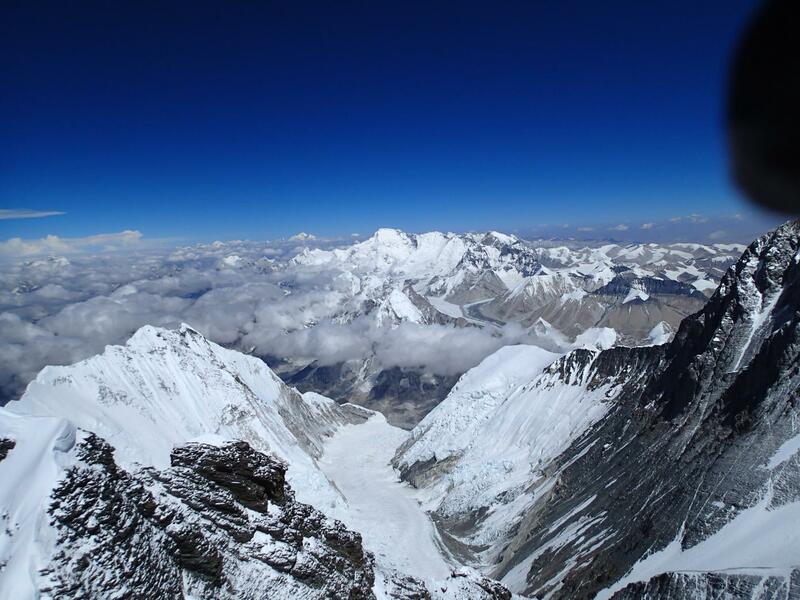 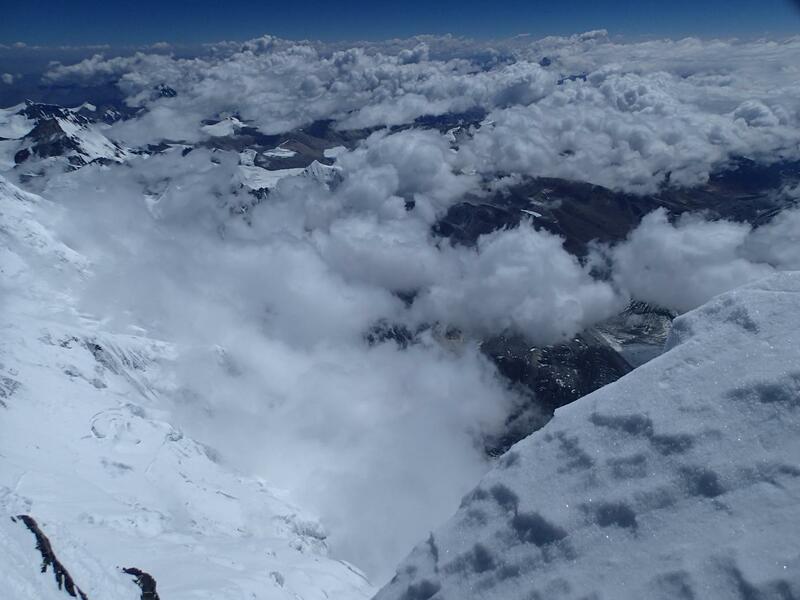 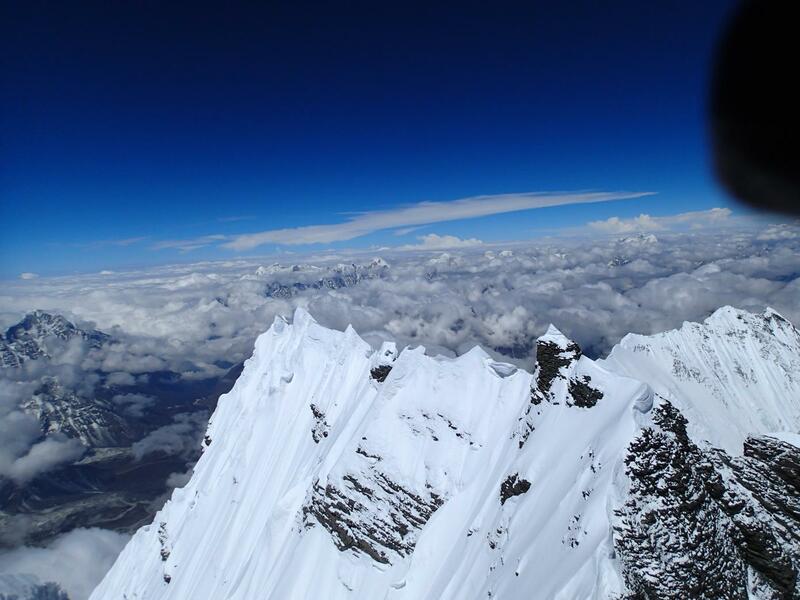 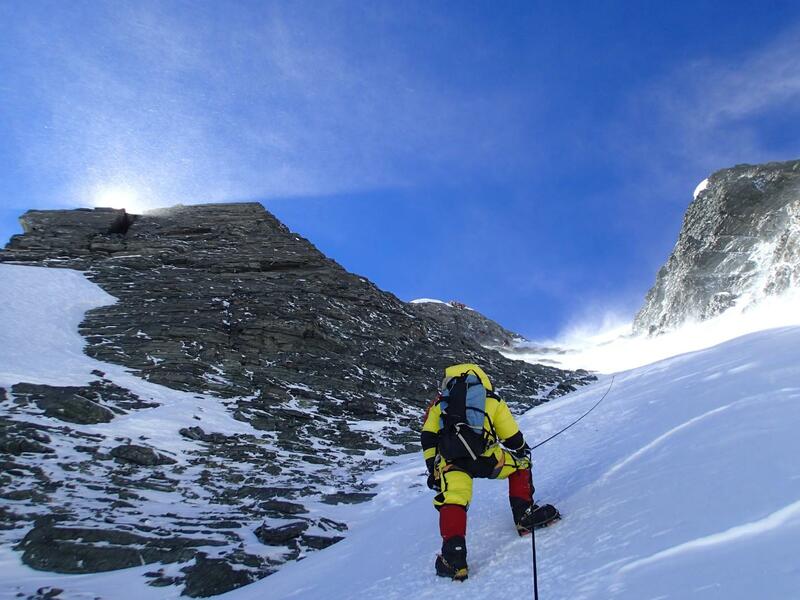 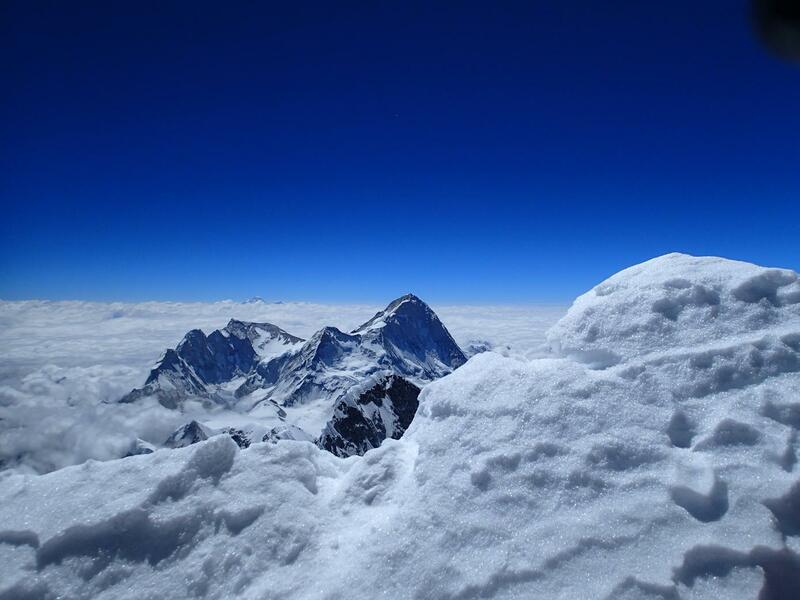 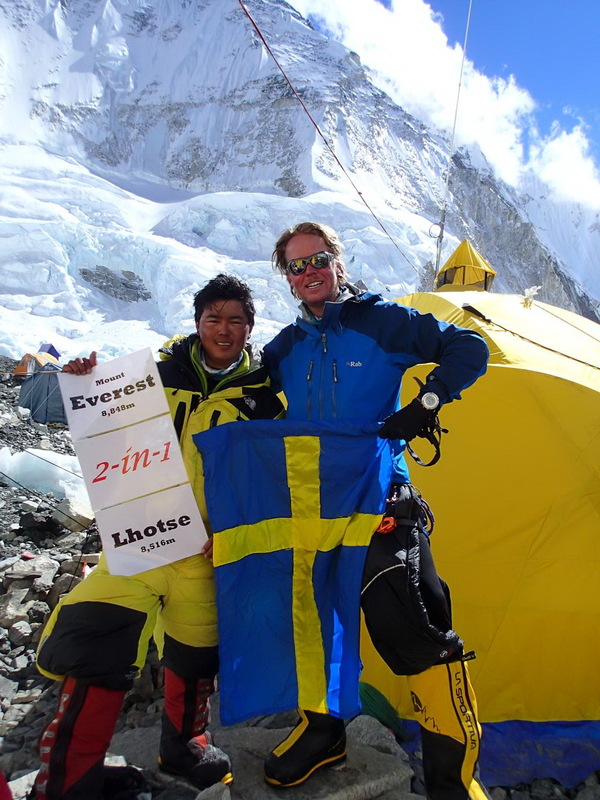 Rinjin had climbed Everest once, in a previous year, but was serving as cook at South Col this year. 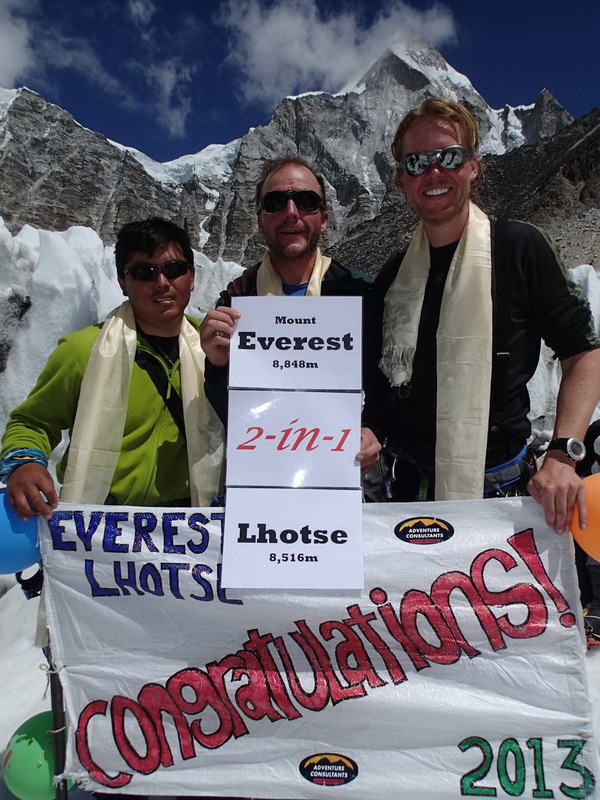 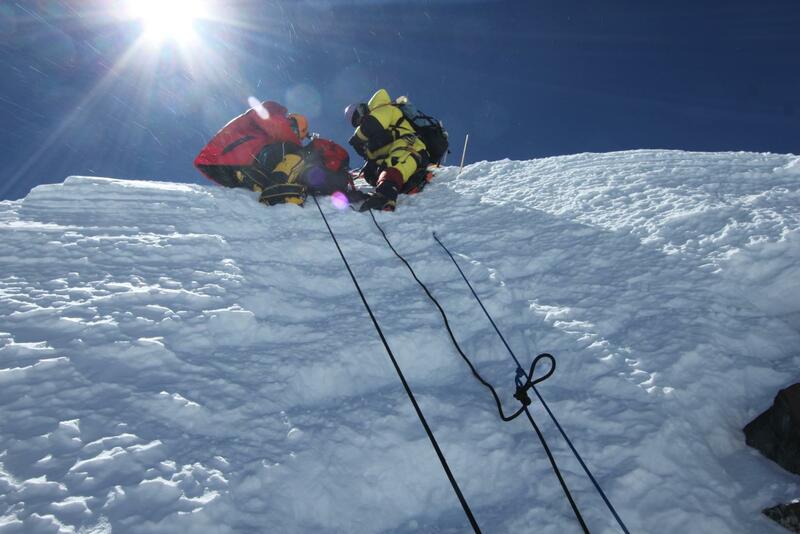 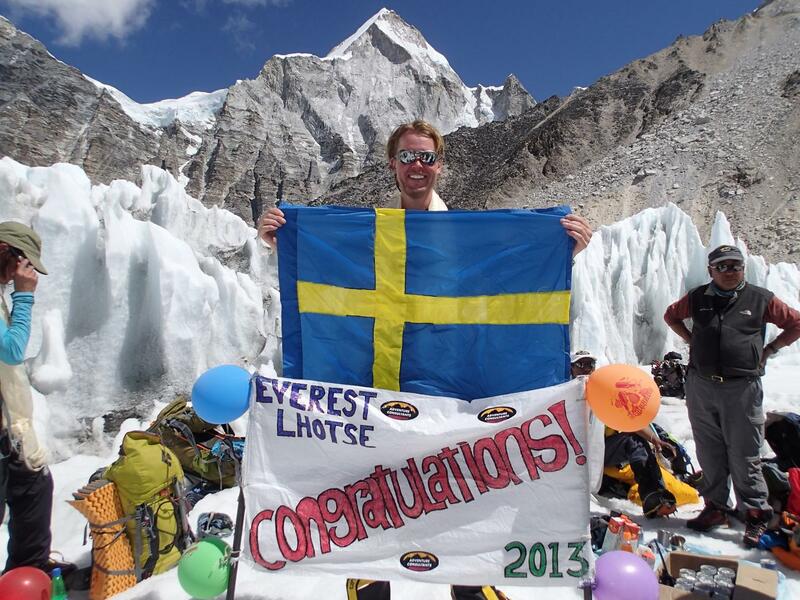 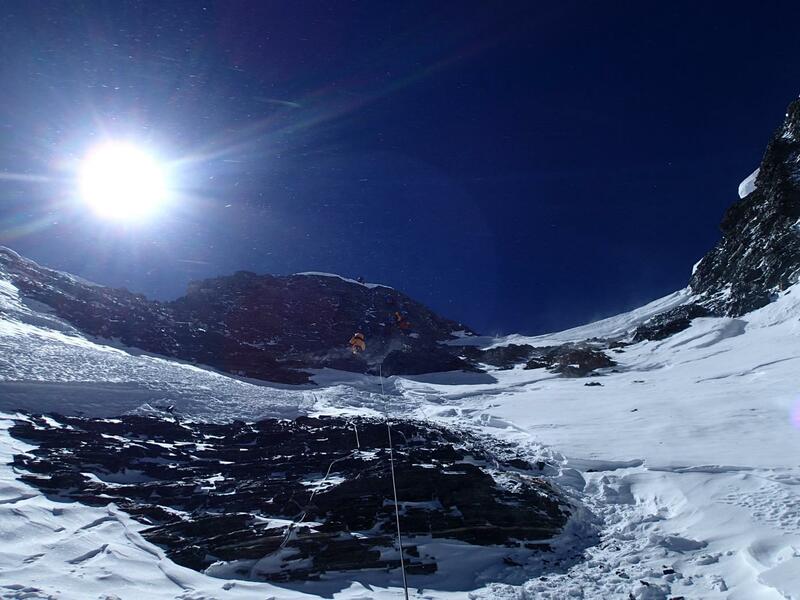 It was the first time climbing Lhotse for all of us. 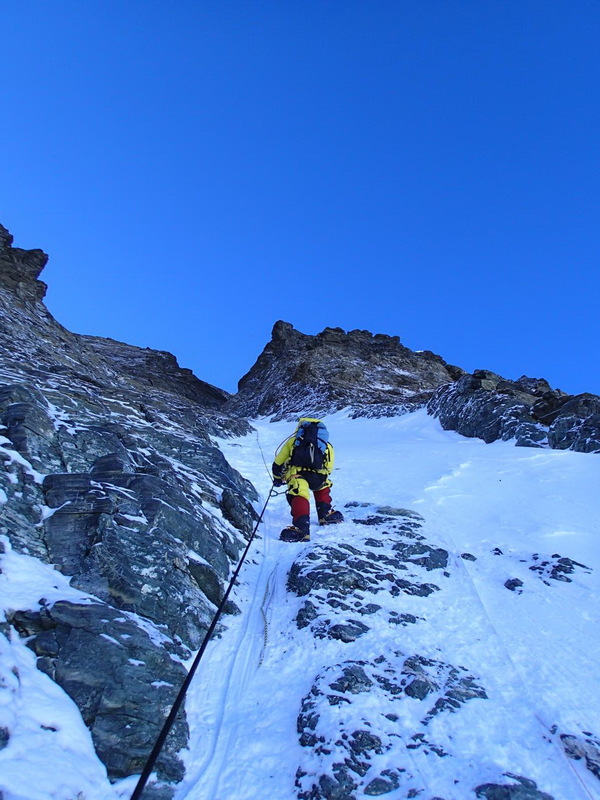 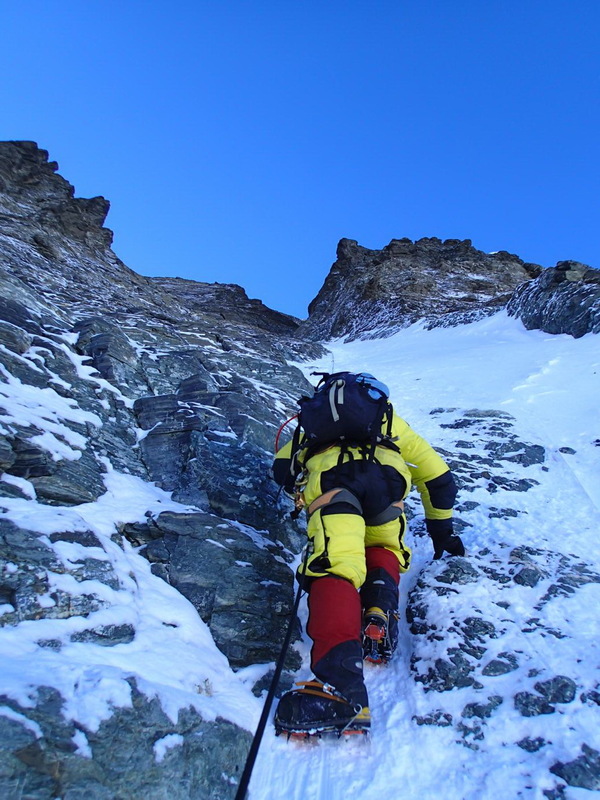 For this we had to first descend back down a few hundred meters across the Geneva Spur, and out on the Lhotse face until we were below Lhotse Camp 4, where we had a steep long climb (~ 800 altimeter approx, I believe) all the way up the very long and steep Lhotse couloir – straight to the summit. 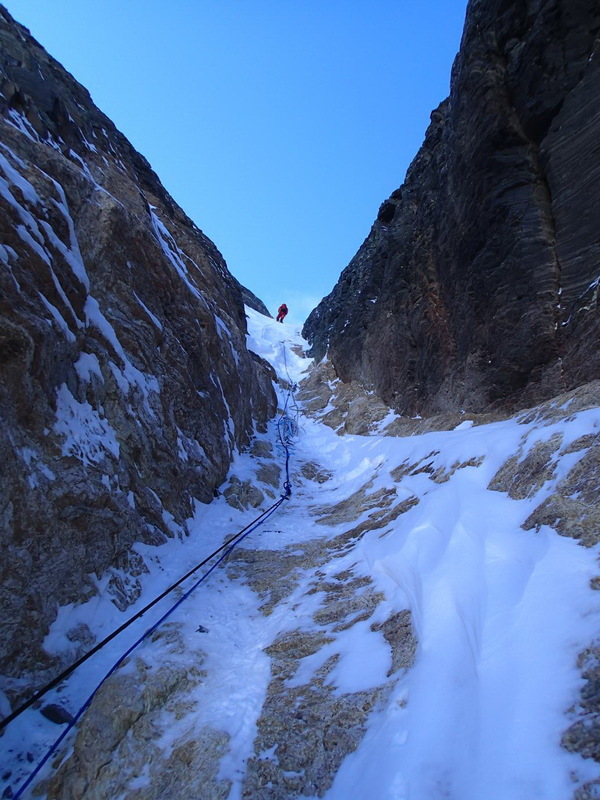 It was fairly tough, and we had to be vigilant to look out for potential rock fall. 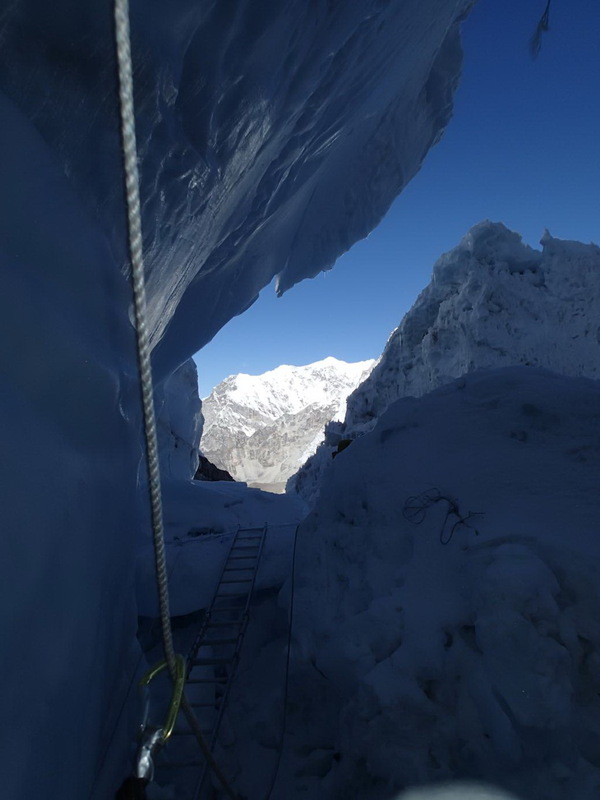 We had departed so that we would let Lhotse summiters departing from Lhotse Camp 4 go ahead of us, to reduce the risk of them kicking rocks onto us. 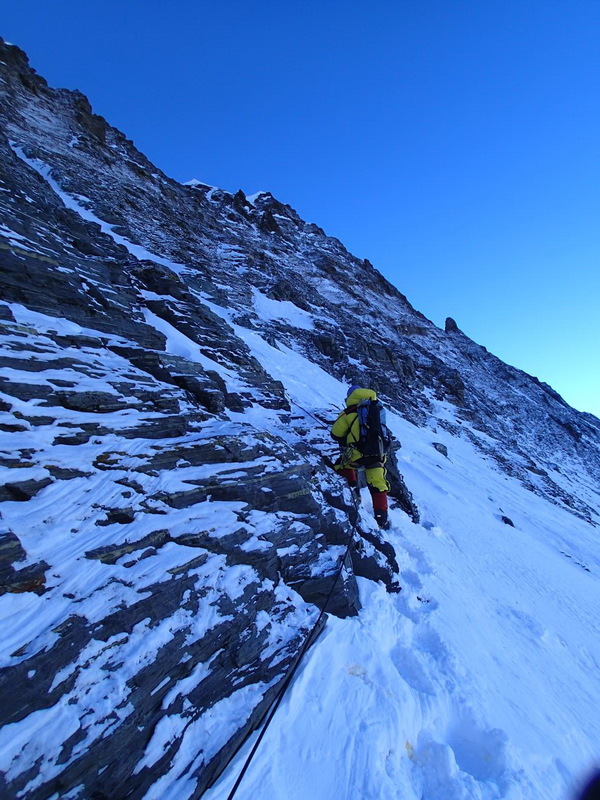 We ended up catching up with some of them right when we reached the summit. 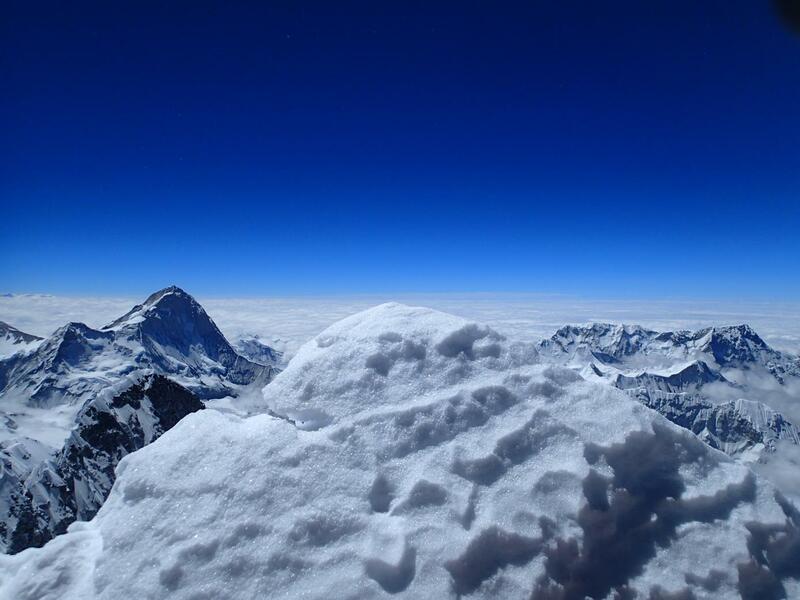 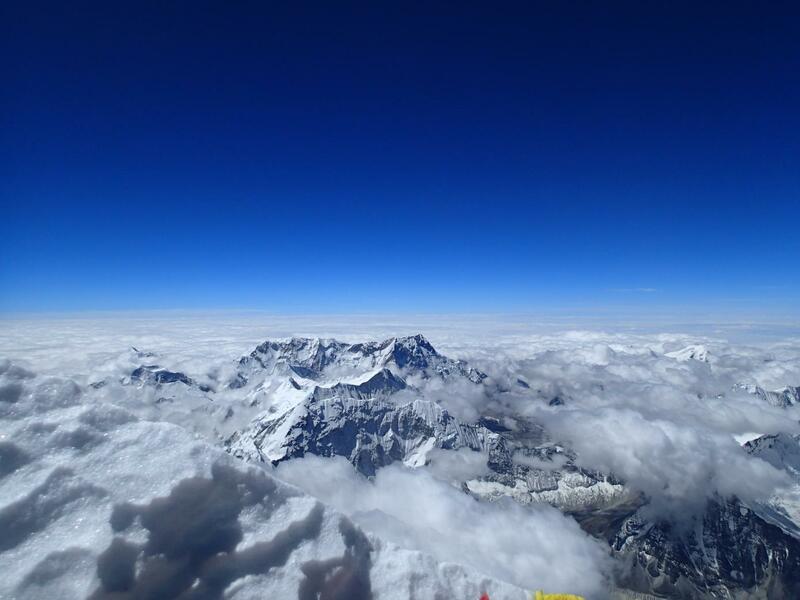 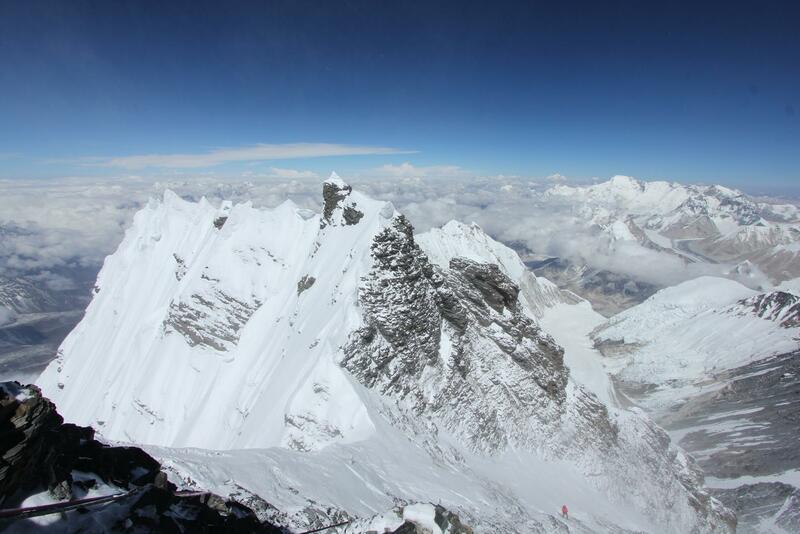 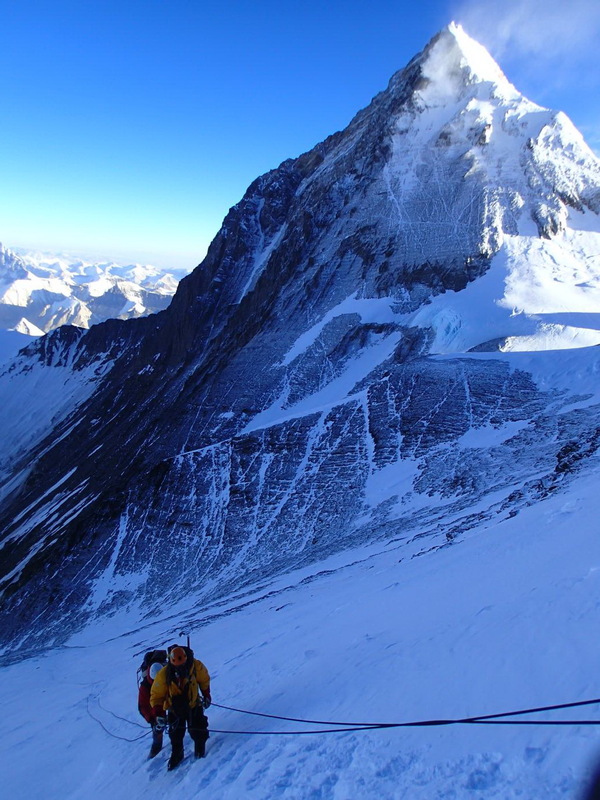 It was an amazing feeling getting up to the Lhotse summit, and seeing the Everest summit from that angle, and looking around the world from that viewpoint, slightly different than from the top of Everest. 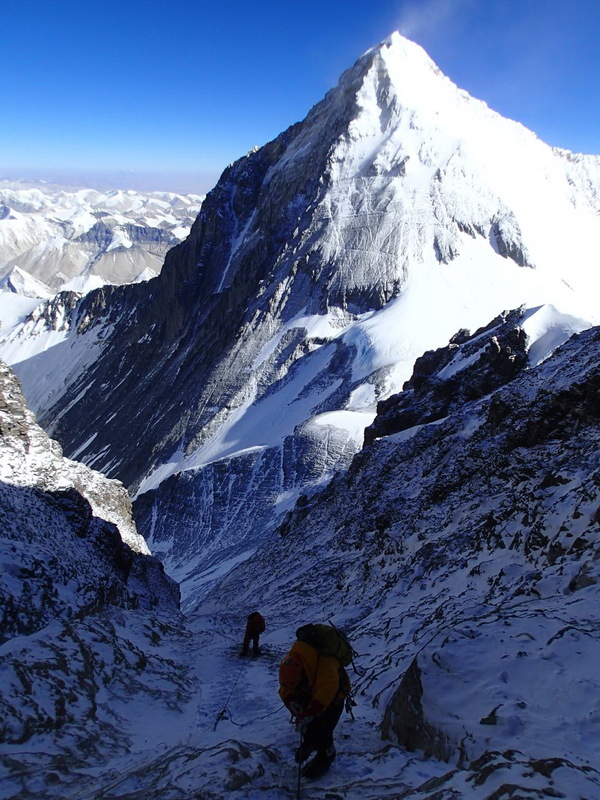 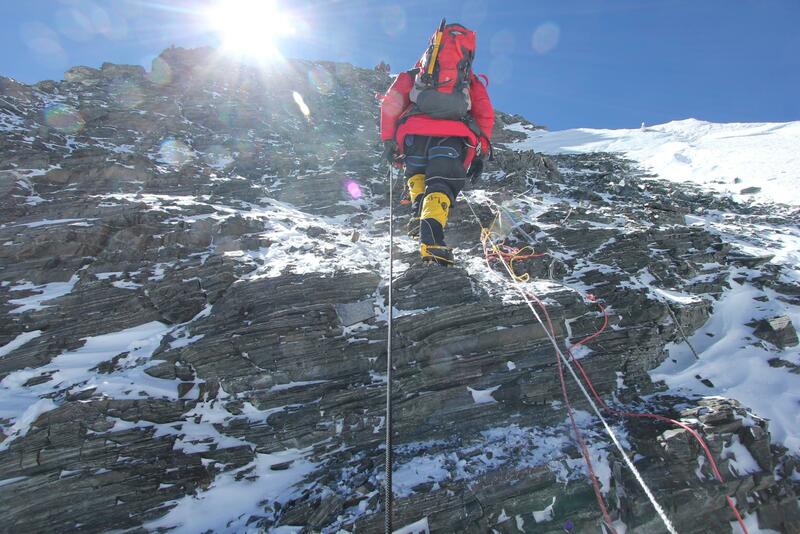 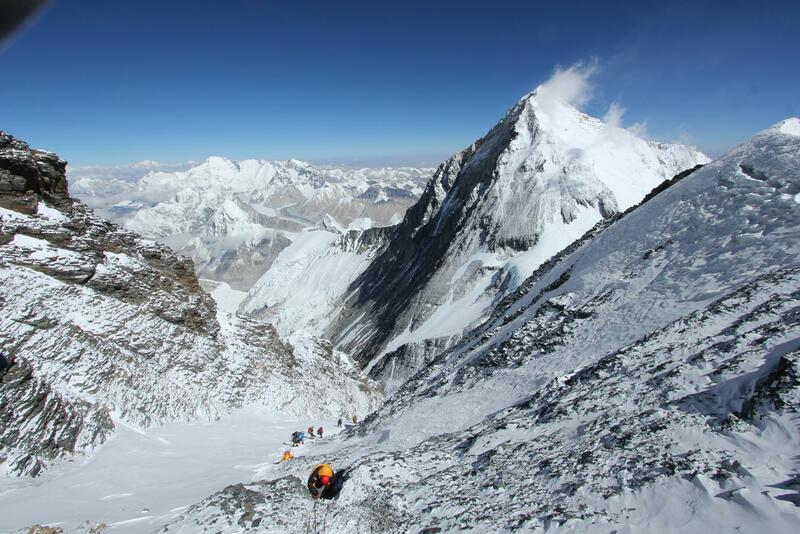 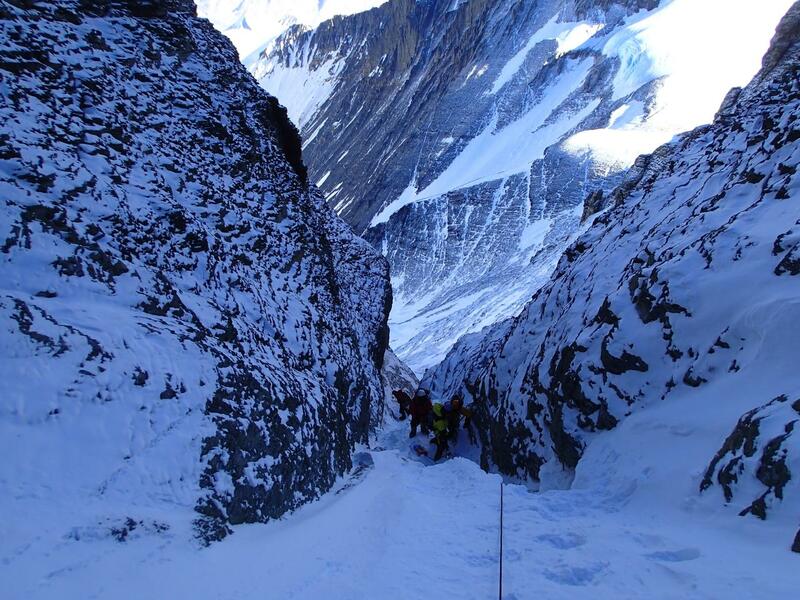 After summiting, we we strong enough to continue all the way back to Camp 2 where we rejoined our entire climbing group! 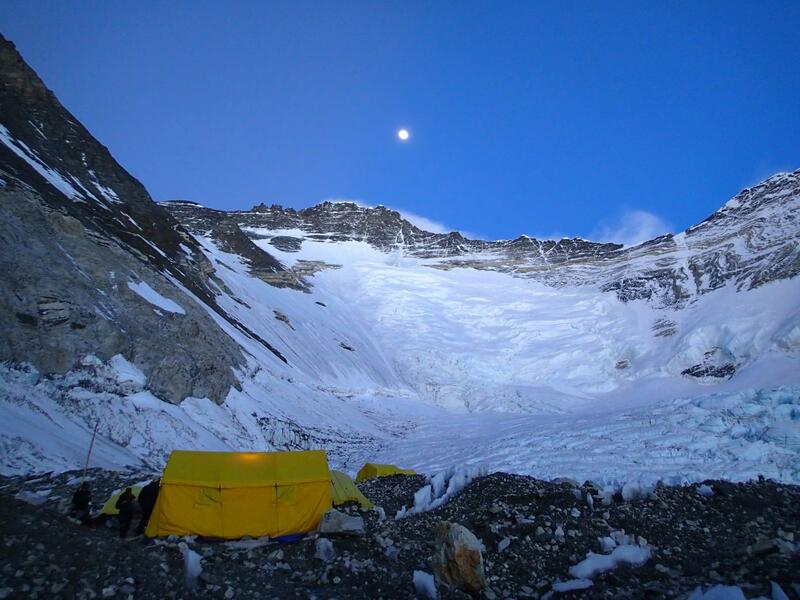 We had a backup plan to stay in Camp 3 if we were too tired to continue. 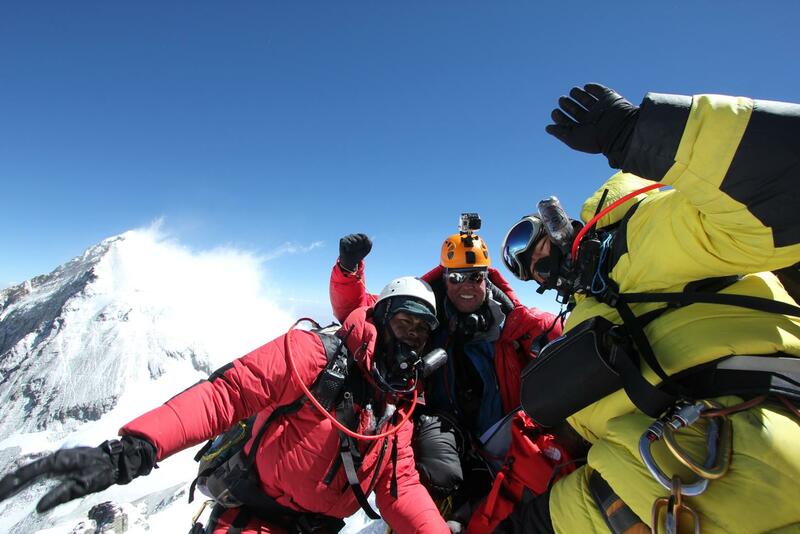 It was great rejoining everyone – everybody was soooo happy! 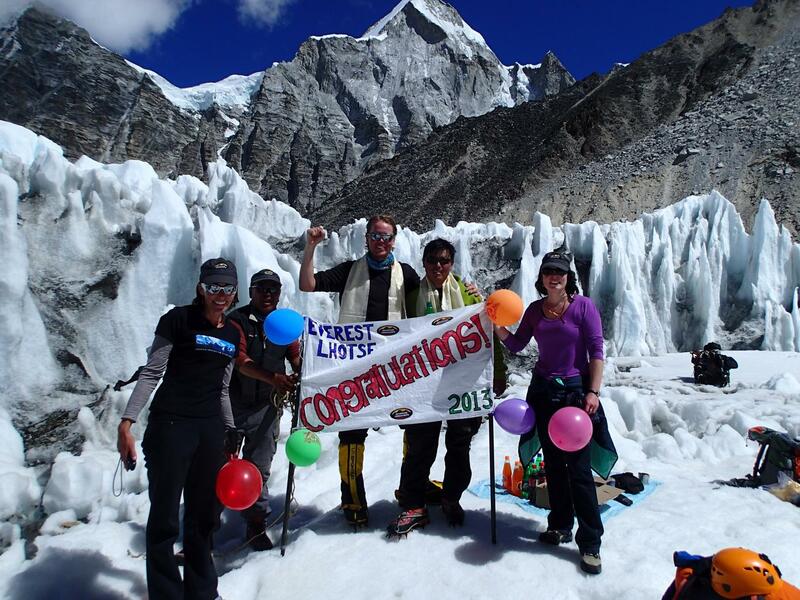 But we saved the real celebration for base camp! 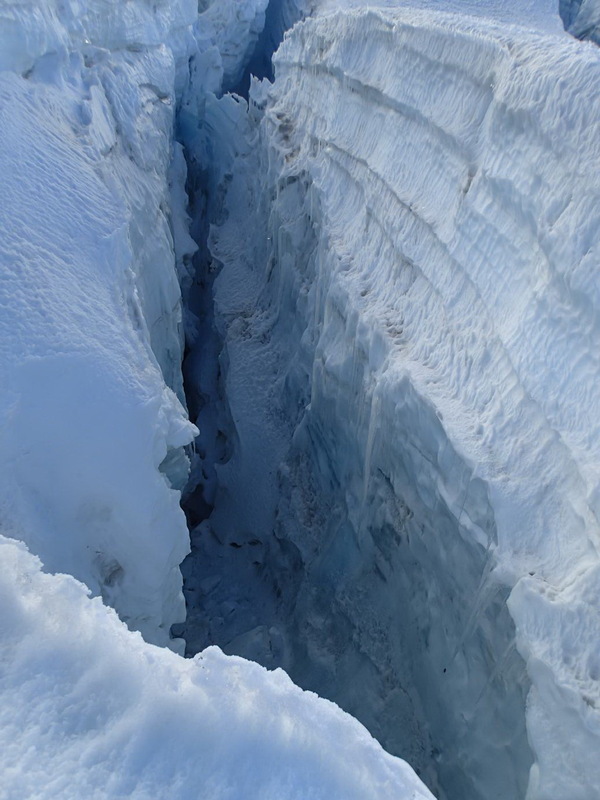 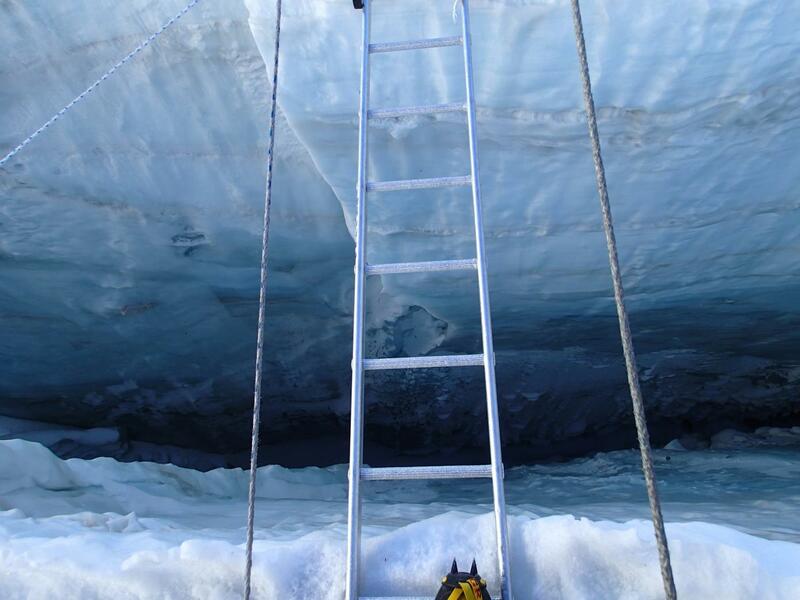 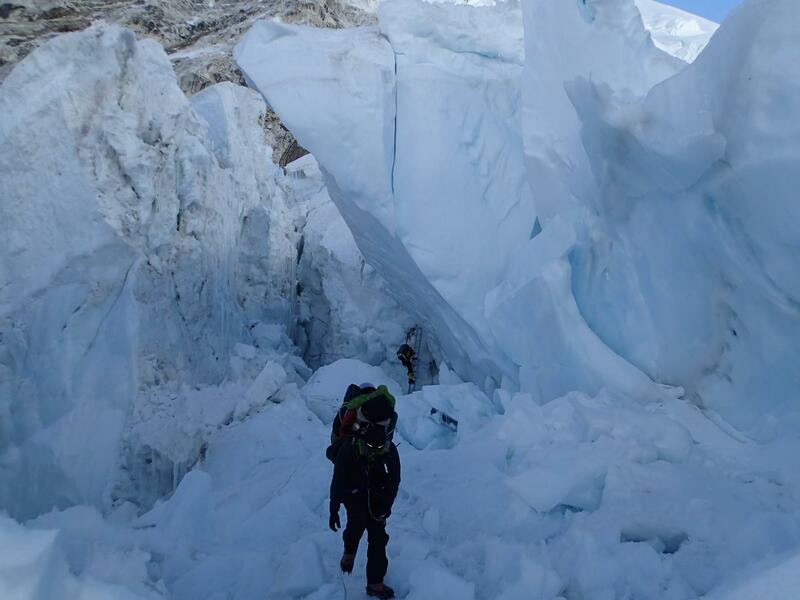 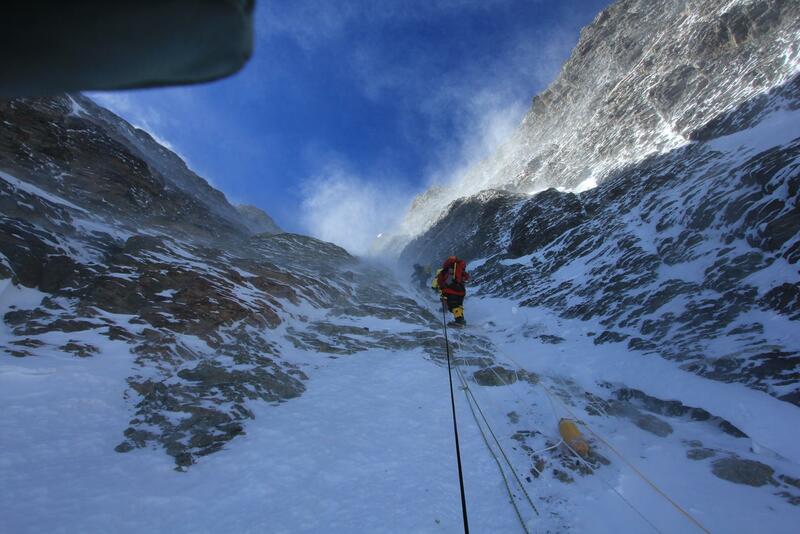 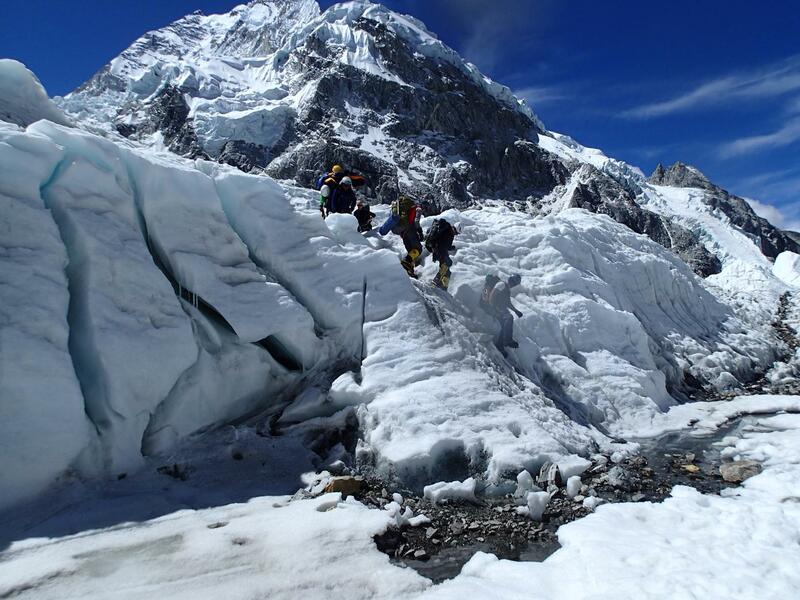 We still had to cross the icefall, which is always dangerous and needed to save energy. 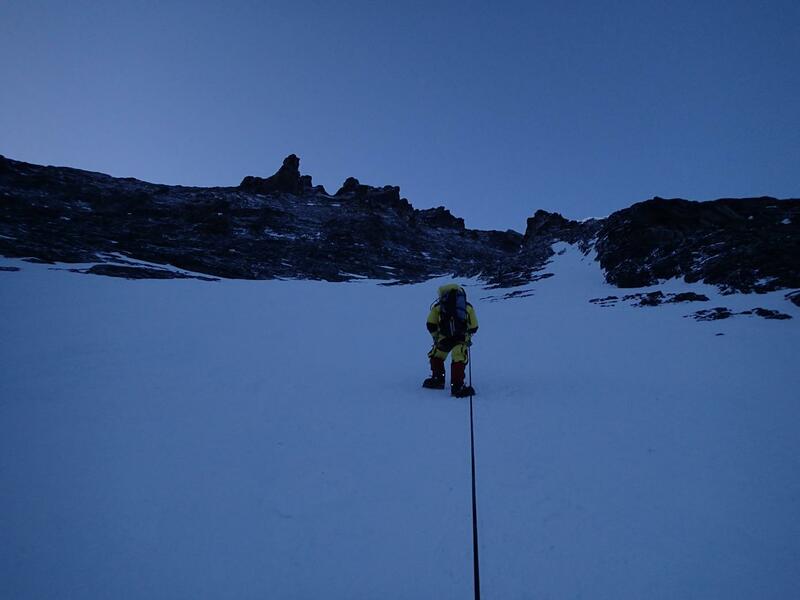 The next morning we left around 5.30am from C2 back down to BC. 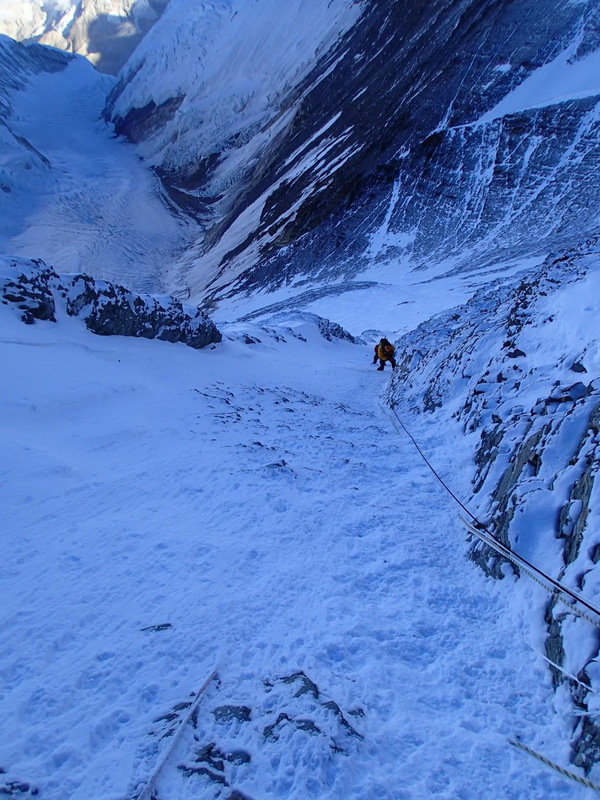 We still had to pass through the icefall, which is probably the most dangerous section because the icecliffs can collapse, whereas in other sections you’re a bit more in control of your own destiny. 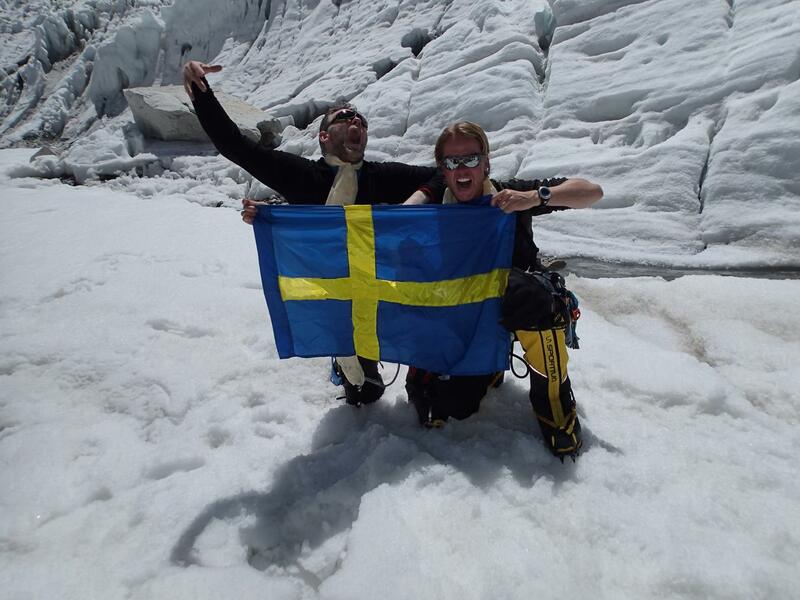 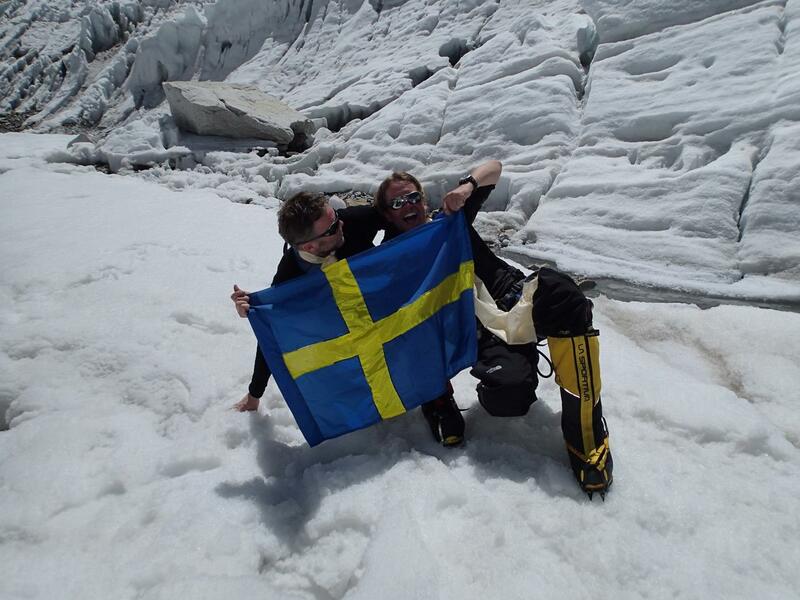 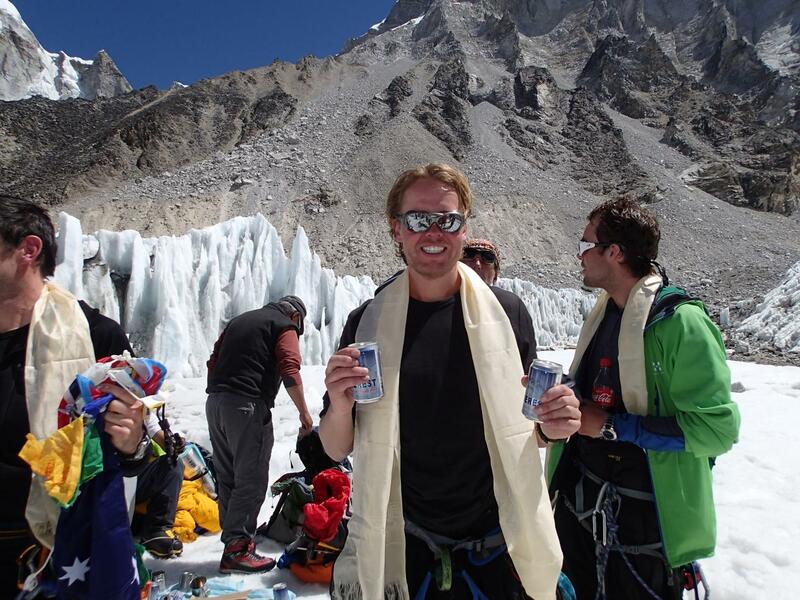 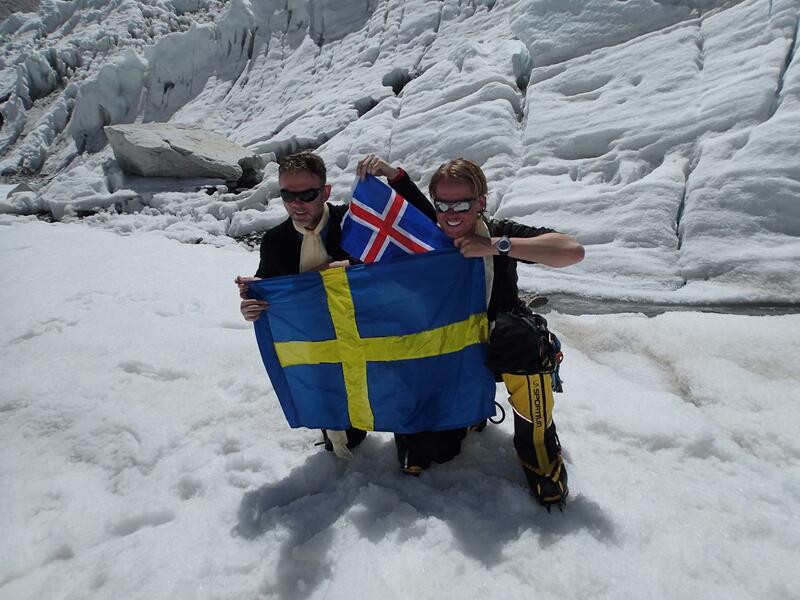 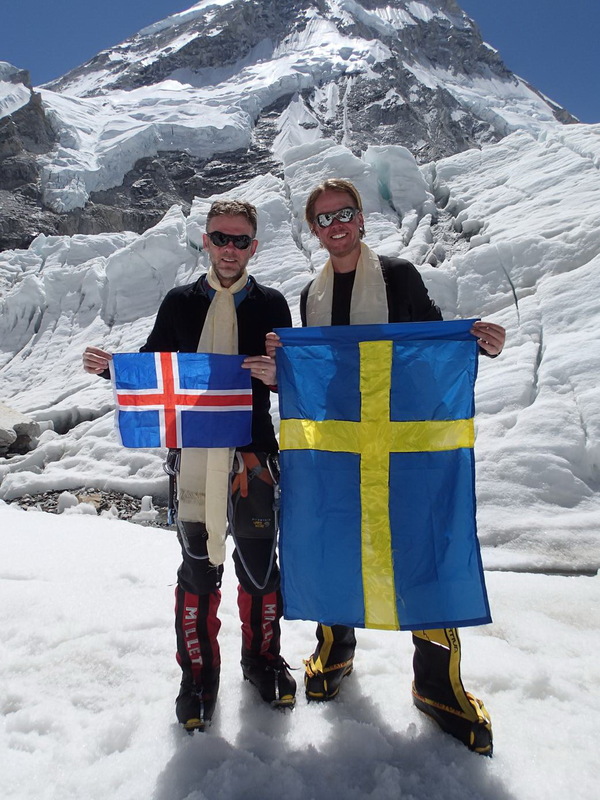 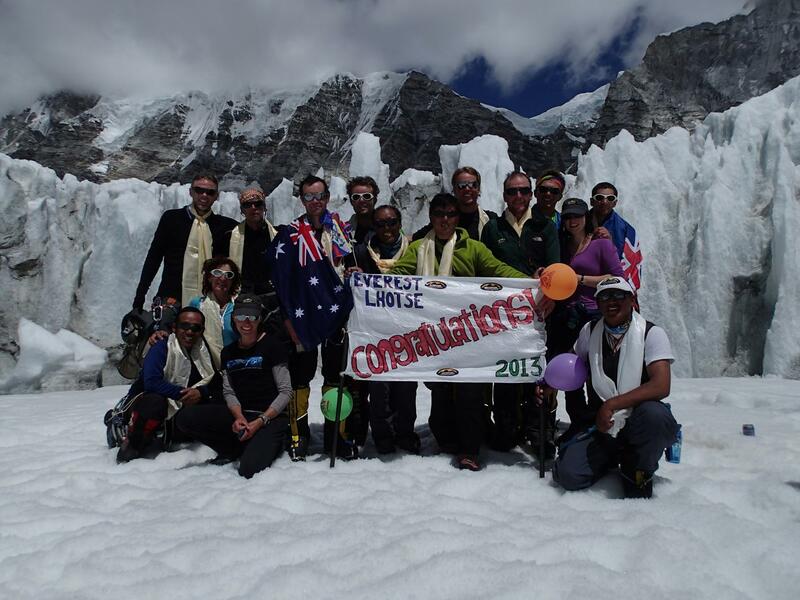 At the base of the icefall, we were met by our base camp crew who saluted us with drinks! 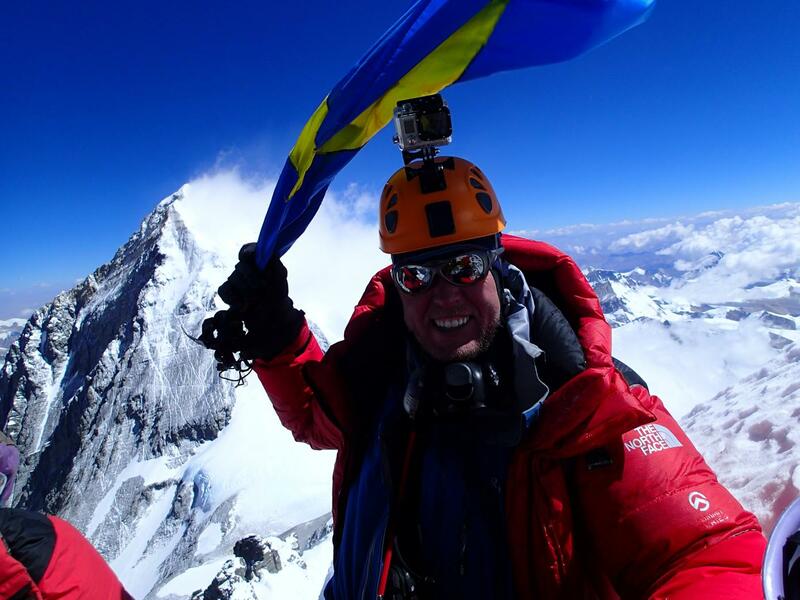 According to Alan Arnette (www.alanarnette.com), including 2013 there are only 12 people worldwide who have done this. 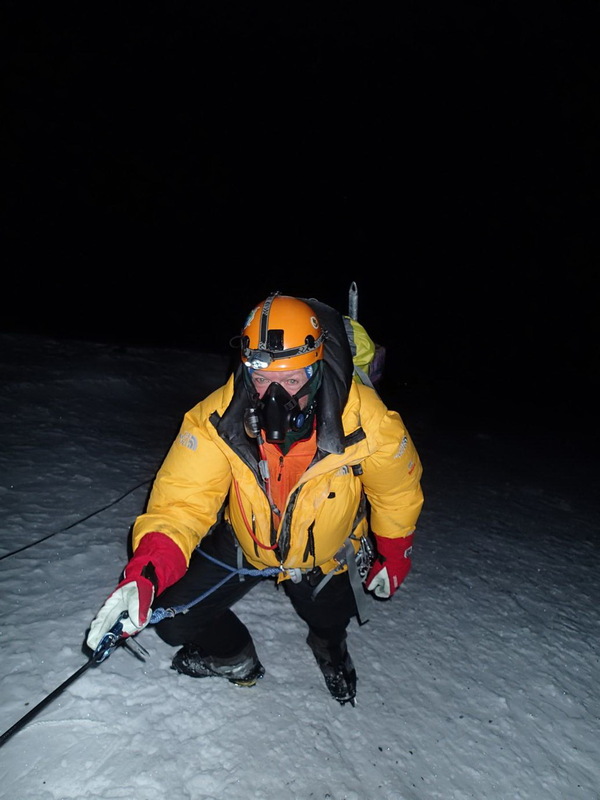 So, I guess I have the right to feel somewhat proud given it was only 4 months earlier that I put a crampon on my foot the first time – but through the rigorous training by Adventure Consultants it was made possible.